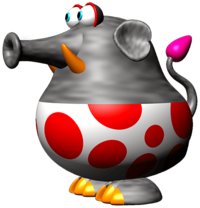 Pak E. Derm is an elephant-like creature that first appears in Yoshi's Story. Their name is a pun on the word pachyderm, a term which is no longer in use; it refers to an obsolete taxonomic order of animals in biology that included elephants, whence Pak E. Derms' appearance was inspired. In Yoshi's Story, Pak E. Derm holds up a sign and does not let Yoshi pass. To pass, Yoshi has to Ground Pound the ground, and the Pak E. Derm will fall away, allowing Yoshi to pass. Yoshi has to act quickly because Pak E. Derm will soon recover. Yoshi encounters Pak E. Derm three times throughout the first level, and it does not appear thereafter. Pak E. Derm's Message Block states, "Pak E. Derm will not let you by, unless you give something special a try." 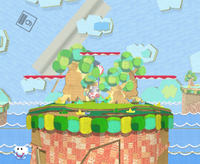 Pak E. Derm also appears in Super Smash Bros. Melee as a trophy and in the background of the Yoshi's Story stage. According to the trophy, there is only one; also according to the trophy, he has been practicing the skill of holding the sign for years. Pak E. Derm is one of the many characters to appear as a sticker in Super Smash Bros. Brawl. The Yoshi's Story stage reappears in Super Smash Bros. Ultimate; by extension, Pak E. Derm reappears as well in the background, having received a very minor redesign. Pak E. Derm also makes an appearance as a Spirit. 3/98 This pesky pachyderm bars Yoshi's path by sticking poles high into the air. Pak E. Derm has been practicing this skill for years, and he's so masterful that he can even block Yoshi's high-flying Flutter Jump. Pak E. Derm is a little unstable, however, and he tends to topple over if Yoshi pounds the ground anywhere nearby. Tousanzou From 「象さん」 zousan, meaning elephant. Spanish Pak I. Dermo From paquidermo, meaning pachyderm. French Pash I. Derm From pachyderme, meaning pachyderm. This page was last edited on March 9, 2019, at 20:37.